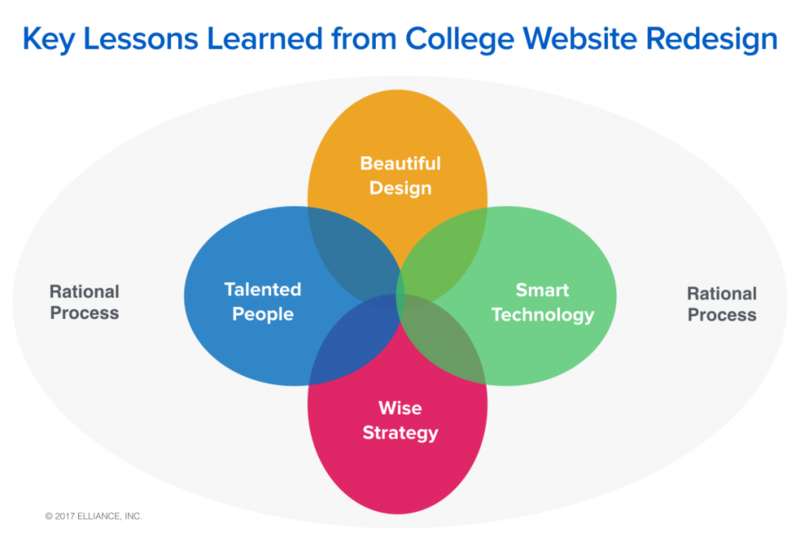 In working with over 100 colleges in the last 25 years, we have learned that website projects are a catalyst for transforming a college — power structures are realigned, the organization is energized, a new inflection point is created, and destiny becomes more attainable. Revenue Strategy, Communication Strategy and Search Engine Ranking Strategy are the three building blocks of a Website Strategy. In redesigning your website, these three components must be orchestrated, prioritized and baked into every aspect of development and design. Ultimately, you become the story you choose to tell, and that story begins with wise strategy. Strategy is invisible. Good design makes it visible. Milton Glaser once said “There are only three reactions to a piece of design: no, yes or WOW! Wow is one to aim for.” We agree. Responsive, mobile first, and beautiful design deepens meaning, delights people and influences the Google bot to rank your website higher. 1. Stakeholder Alignment: Deft diplomacy and discipline are required to ensure that consensus is built across all project stakeholders. All key departmental/university business, brand and technology stakeholders must be involved in discovery, strategy, creative presentations, and final launch for the project to be successful. It’s vital that the design be flexible enough to enable Deans and content creators to shape the user experience in accordance with their needs. It should never be a one-size-fits-all proposition. 2. Content Plan: Creating a detailed content inventory is an important first step in a website project. It forms the basis for deciding on what content will be migrated, adapted, archived or needs to be created. A redesign is an opportunity to modernize your brand story and your unique selling proposition. 3. Critical Site Launch Details: A detailed plan must be established to ensure the current inbound links, SEO rankings, and social share counts are carried forward to the new website. 4. Thorough Testing: User testing, ADA compliance testing, style compliance testing all ensure brand trust. Using mutually agreed-upon tools and processes helps eliminate surprises. 5. Consistent Project Management: Project milestones and weekly status calls are a key staple of successful web projects. Folding side-conversations into these calls prevents downstream challenges. 1. The Right Systems Architecture: to support centralized services (news), strategic objectives (faculty experts, media relations), audience separation (prospects vs. current students/faculty), etc. 2. The Right Customization: to ensure various audiences, schools, departments and centers of excellence all receive the attention they deserve. 3. The Right Domain Architecture: to enable rational content management, maximize SEO rankings, and strengthen marketing campaigns. 4. The Right CMS: which aligns with university’s prior investments in technology and talent, and plays well with tools such as social media, Analytics, lead attribution, marketing automation, CRM, and ERP. It takes a village of craft-minded people to build a website. Destiny-changing websites are created when inch-wide, mile-deep talent collaborates and are quarter-backed by a strategist and project manager who ensure the team’s focus is unwavering. Like any process, the process of redesigning a website will only be as good as the people participating in it. Elliance people mind the details at every step, and work carefully to minimize client risk while liberating greatness. Looking for a college website redesign agency? Learn more about our website design services and higher education marketing services, or contact us.